We often offer discounts midweek on direct bookings of two or more nights. We also offer active duty military discounts. Holiday/Festival days excluded. Nights must be book consecutively. For more information on applicable discounts, please contact us by phone or email. due to the exceptionally high fees charged by the company. or even yourselfYOU DESERVE IT! your favorite person to one of the following packages. Discounted tickets to the Mendocino Botanical Gardens now available to all of our guests. Please let us know when you make your reservation if you would like to purchase them. 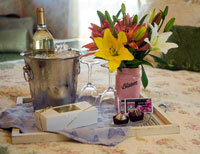 "Enjoyed a very homey and cozy fun time at your B&B. The breakfast was out of the world. Excellenct service and atmosphere. Hope to be back again." 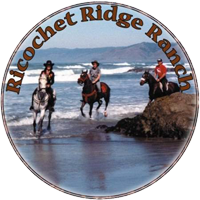 Mendocino County wine, chocolates, flowers in a take-home vase, and two tickets to the Mendocino Coast Botanical Gardens. In-room on arrival. Must book at least 4 days in advance of stay. Add wine and cake to your celebration. In-room on arrival. Must be booked at least 4 days in advance of your stay. Treat the special couple to a getaway before the baby arrives. 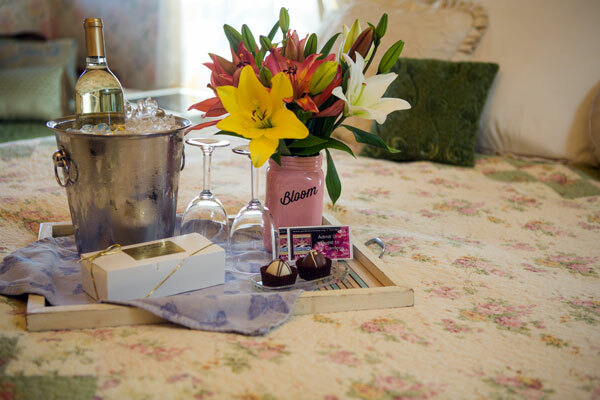 Includes; Sparkling Cider, Cheese plate with fresh fruit, chocolates, flowers, and a free upgrade to a larger room if available at check-in. Charter boat whale watching trip with All Aboard Adventures. Call us at 1-800-831-5327 to make your reservations!